So how do you have fabulous Christmas food – without the stress? The award winning Four Gables Food tell us about their Christmas Hamper. 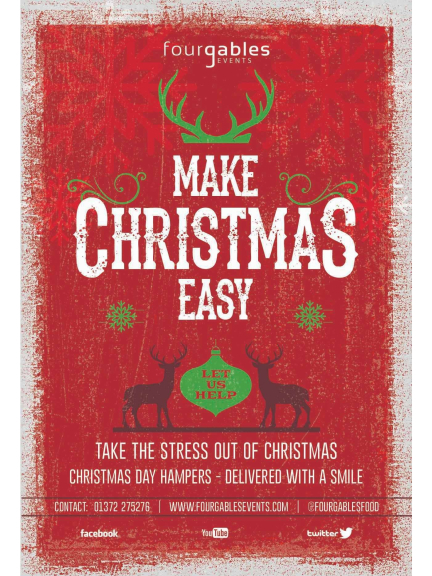 Take the stress out of Christmas with a hamper delivered to your door. The premise is simple; we cater for the main event and into the evening, deliver it at a pre-arranged time to you on Christmas eve and you're good to go. Delicious food, no prep, a small amount of cooking (full instructions provided!) and no washing up. More time for you to win at monopoly and fall asleep in front of the Queen. Winner!